Anna (Russian: Анна) or "The Huntress" is one of 15 Killers currently featured in Dead by Daylight . 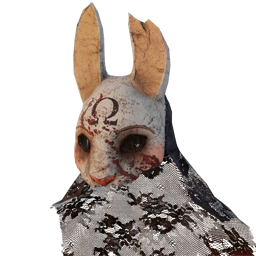 She was introduced as the Killer of CHAPTER V: A Lullaby For The Dark, a Chapter DLC released on 27 July 2017. 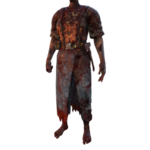 The Huntress is a ranged Killer, able to throw Hunting Hatchets at Survivor to injure them from a distance. Her personal Perks, Beast Of Prey , Territorial Imperative & Hex: Huntress Lullaby , allow her to apply pressure through better Map awareness and enhanced chasing abilities. Her Perks revolve around the hunt of the prey, to track and find so that she can get close enough to make the kill. As soon as Anna was able to walk, her mother started teaching her how to survive a harsh, solitary life in the northern woods. Living in such an extremely remote and dangerous area required skill and resilience. When sunlight became too dim for productive activities, they would take refuge in their house, a sturdy old cabin constructed to resist the toughest winters. Close to the hearth’s warmth, Anna would rest in her mother's arms, surrounded by the few wooden toys and masks she had crafted for her. Drifting off to sleep with stories and lullabies, she dreamt happy dreams, ignorant of the events that would soon change everything. Anna and her mother were stalking a great elk through the woods. They knew it was dangerous prey, but it had been a particularly difficult winter and they were almost out of food. The spectre of starvation frightened them more than any forest creature. Without warning, the elk reared, bellowed and charged at Anna. She was paralysed with fear as the whole world seemed to shake under the immense beast’s pounding hooves. The elk was close enough for Anna to see the murderous fury in its eyes when her mother threw herself in its path, axe in hand. A blood-curdling scream escaped from her lips as the elk impaled her upon its antlers and hoisted her into the air. With all her strength, she brought her axe down on its head again and again while it tried to shake her loose. With a sickening crack, the antlers snapped and Anna’s mother was free. The beast collapsed. Anna was too small to move her mother’s broken body, so she sat with her in the clearing where she had fallen. To distract her from the dying elk’s cries, Anna’s mother held her and hummed her favourite lullaby. They stayed like that, the huntress and the elk getting quieter and colder, until Anna was alone in the silent forest. Eventually she stood up and started the long walk back home. Still a child, she knew just enough about life in the frozen forest to survive. She followed her instincts and became one with the wild. She got older and stronger and practised her hunt. As she grew into a dangerous predator, her humanity became a half-remembered dream. She widened her territory and lived off her hunts. She worked her way up through squirrels and hares and mink and foxes. Eventually she grew tired of them and hunted more dangerous animals like wolves and bears. When unsuspecting travellers came through her woods, she discovered her new favourite prey: humans. Unlucky souls who strayed into her territory were slaughtered like any other animal. She liked to collect their tools and colourful garments and especially toys when there were little ones. But she could never bring herself to kill the little girls. Girls she would take back to her house, deep in the woods. They were precious, and looking at them woke up something deep in her heart. She craved the closeness of a loved one, a child of her own. Among the pillaged wooden toys, dolls and story books she couldn't read, the girls would be tied by the neck with a rough and chafing rope fastened firmly to the wall. She couldn't let them wander off, or they would surely die outside. Every time, the girls would waste away and die of cold or starvation or sickness. Every time, it plunged Anna deeper into pain and sorrow and madness. She was compelled to try again, and started raiding the nearest villages to slaughter families and kidnap their daughters. She wore one of the animal masks her mother crafted for her so many years earlier to try to calm the frightened children. Villagers spread the legend of a half-beast lurking in Red Forest: The Huntress, who killed men and ate little girls. War eventually came to the forest. German soldiers began to pass through, on the march to attack the collapsing Russian Empire. During these dark times, there were no more travellers. The villagers had abandoned their homes, and no more little ones to be found; only soldiers. Many of them were found with violent axe wounds. Whole groups disappeared mysteriously. Once the war was over, the rumours of The Huntress disappeared with it, engulfed by the Red Forest. 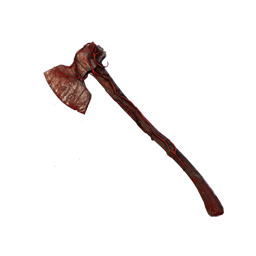 Once obtained, other Killers will be able to find The Huntress' Perks in their respective Bloodwebs from that point onwards. 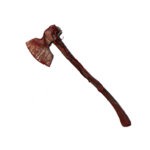 The Broad Axe is a Primary weapon for the Huntress. A traditional axe with a large and heavy head, suitable for squaring logs and planks. Like the Doctor in Punishment mode, she holds her weapon with both hands. She also swings with both hands. 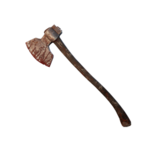 When she hits a Survivors , she wipes the blood off the axe with her arm. 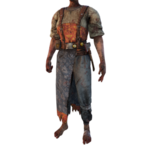 This is similar to the Trapper , only that he wipes his weapon over his arm and the Huntress wipes it under. A skill taught by her mother and mastered in the wild. The Huntress can throw Hatchets with deadly precision. Start the Trial with 5 Hatchets. Charge throw for maximum throwing speed. Hatchets are consumed on use. Refill Hatchets at Lockers . The Huntress hums from 45-20 metres, her Terror Radius starts at 20 metres. 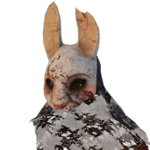 There are currently 3 Achievements related to The Huntress. Players may customise their Character by choosing one outfit style from each category. 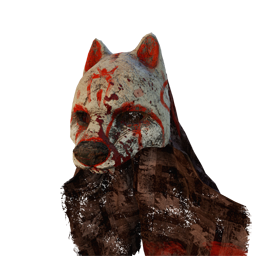 Blood-stained attire is obtained after The Huntress reaches Level 50 and prestiges. Try winding up a Hatchet shortly before you think a Survivor might attempt to drop a Pallet or vault a Window. Such hits are often easy to land due to the Survivor's animation lock. 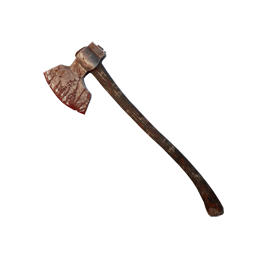 Try to go for a one-two punch: injure the Survivor with a Hatchet at close range and then go for a Lunge attack. 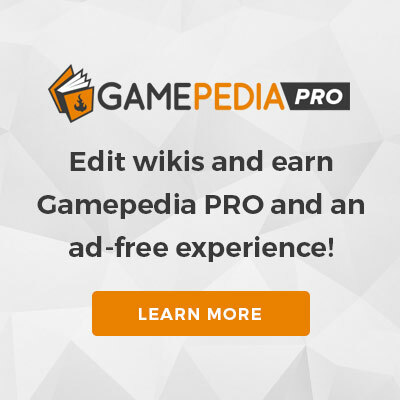 This form of attack is faster than two regular hits. The Huntress was called Bear at some point during development, hence the BE tag in her file names. 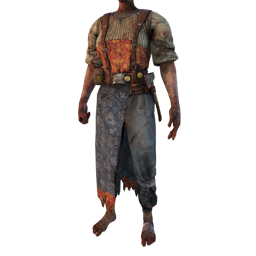 The Huntress originates from the time of around World War I, which made her the oldest Killer in the Game regarding the time period she was taken from until the release of CHAPTER XI's The Plague . 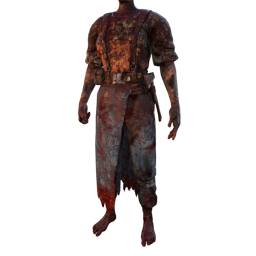 The Huntress was the first Killer to have a ranged attack and remains the only one with a continuous access to it. The Clown and The Plague have situational ranged attacks. The Huntress is the third female Killer. Like most other female Killers, she also has a decreased movement speed. The Lullaby sung by The Huntress is a Russian lullaby called "баюшки баю" (Bayushki Bayu). It warns children to not sleep on the edge of their bed, otherwise a wolf will come and drag them into the woods. 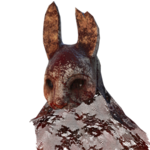 The Huntress was the first playable Character with an unknown surname. 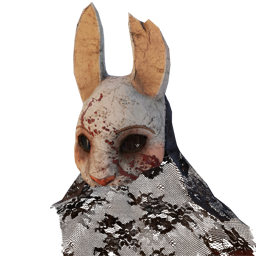 The Huntress is the third Killer to wear face masks. 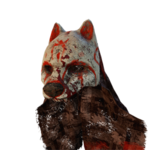 The Huntress is the only Killer that involves the Lockers because of her Power. 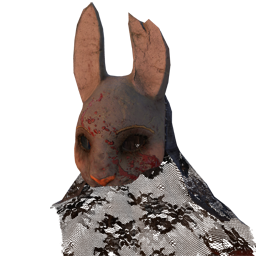 The Huntress is voiced by Emily who also sung the Lullaby. 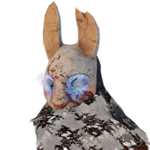 The Huntress is currently the only Killer to swing her primary Weapon with both hands. Insidious and Monitor & Abuse do not affect her humming as it is independent from the Terror Radius and unaffected by any Perks that change that. 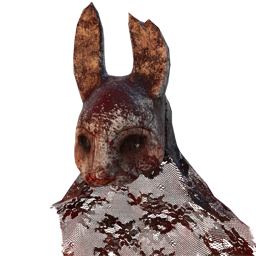 The Huntress' Hare mask might be inspired from similar masks worn by the Spider Splicers in Games of the BioShock franchise. The Huntress is heard grunting when she attacks or throws her Hatchet. The Huntress wears a silver ring on the middle finger of her left hand, similar to Ace Visconti. She likely does this due to her affinity for collecting shiny things. 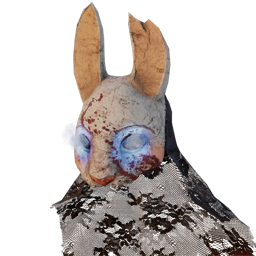 The Huntress is one of the most human-looking Killers in the game, as she has very few unnatural alterations done to her by The Entity, however, she does have pitch-black, animal-like eyes.